Enjoy these flavorful black bean burgers with black beans, salsa & chopped fresh cilantro. These Southwest Black Bean Burgers please even meat-eaters! Use pulsing action to process bread crumbs, mayo, seasonings and half the beans in food processor until well blended. Transfer to large bowl; mix in celery, cilantro and remaining beans. 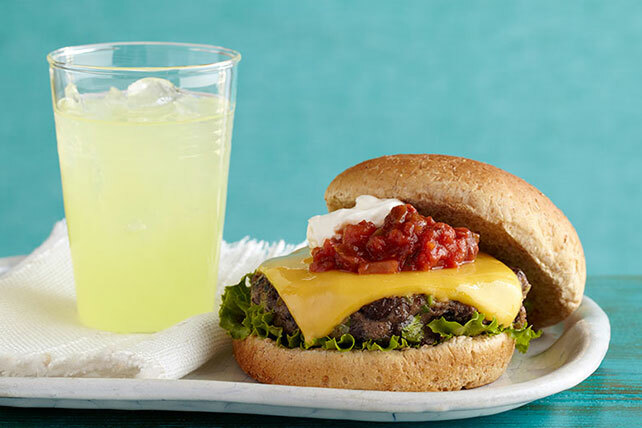 Shape into 6 (1/2-inch-thick) patties. Cook in skillet sprayed with cooking spray on medium-high heat 5 min. on each side or until done (160ºF). Top with Singles; cook 1 min. or until melted. Fill buns with lettuce, cheeseburgers, salsa and sour cream. Save 30 calories and 4g of fat per serving by preparing with KRAFT Light Mayo Reduced Fat Mayonnaise and BREAKSTONE'S Reduced Fat or KNUDSEN Light Sour Cream. In addition to the other burger toppings, top with chopped avocados or guacamole. Substitute 4 green onions, finely chopped, for the celery.